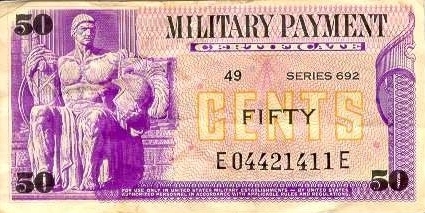 During the Vietnam war, United States Military Payment Certificates (MPC) were issued as payment to all in-country military personnel, in lieu of US Dollars. Simply, this was done to reduce the amount of 'hard-currency' circulating through the South Vietnamese economy, where it could be obtained by the VC/NVA and used to finance their own war efforts, internationally. MPC came in note form only - 5 cents, 10 cents, etc. 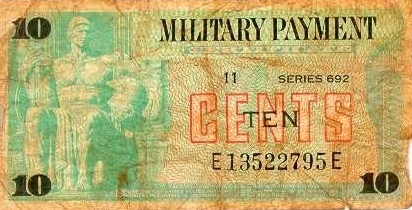 Whilst MPC was only suppose to be used on Military bases, it appear the Vietnamese had ways of converting it and normally it could be used for purchases in local towns and villages. The advantage MPC had over normal currency, was that it could be changed for a new series and old notes became worthless overnight. MPC series changes occurred on a regular basis. These changes seemed to be kept a poor secret though, because local Vietnamese holding large amounts of MPC, would always seem to be trying to 'sell' it, just prior to a new series changeover!